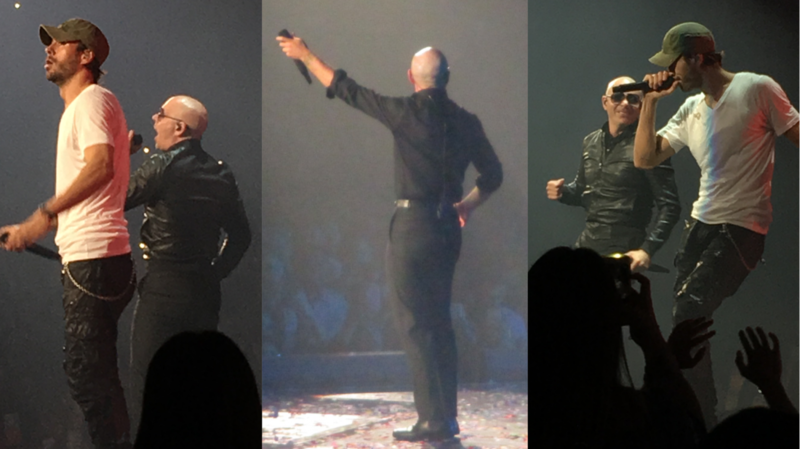 Pitbull and Enrique Iglesias brought the party to Chicago, IL last night for an amazing opening show of their highly anticipated North American tour. The duo brought the house down as they put on an unforgettable performance at the Allstate Arena. Upon arrival, fans had the chance to get their hands on some new merchandise featuring products from Pit, Enrique, and CNCO. The merch stand included shirts, hoodies, posters, and more. Here's the merchandise stand at the #EnriquePitbullTour tonight! ——————————————————— #Pitbull #MrWorldwide #Mr305 #ArmandoChristianPerez #PitBerry305 #EnriquePitbullTour #PitbullEnriqueTour #Pitque • Visit PitbullUpdates.com for more Pitbull news & media! The stage setup is entirely different from what Pit usually performs on during his tours. It included an extensive catwalk and ramps. The first to take the stage was opening act CNCO. The hot Latin boy band wowed the crowd as they performed an engrossing 30-minute set. Then, Mr. Worldwide himself took the stage to perform a captivating set which had the sold-out crowd of over 18,000 fans on their feet dancing. He began his set performing one of his signature tracks, “Feel This Moment“. He continued to play more hits like, “Hey Ma“, “Culo“, and “Fireball“. He ended his hour-long set with his first No. 1 single, “Give Me Everything“. Next up was Spanish heartthrob Enrique Iglesias, who had the entire crowd oohing and aahing as he performed a hour-long set including classics like, “Hero” and new hits like, “Subeme La Radio“. The night ended with confetti and pyro-effects blasting from the stage as Pitque joined together to perform their mega-hit, “I Like It“.